* Selection of the Newcomb Book Award winner. If any of these are of interest to you, come by the meeting tomorrow night at 7 PM at Emerson Community Center on Pettee St, hear what's going on and let the council know what you think. Tell Us a Story - Come on down to Gregorian Rugs this Fri May 22 at 7:30 PM for the 4th Nomad Story Slam. Come hear fabulous stories told by your neighbors or throw your name in the hat to tell your own story. They must be 5 minutes long, be true, and be connected to the night's theme - "a long way from home". This story slam will feature three invited Newton authors as guest story tellers - Gail Spector, author of Legendary Locals of Newton, David Kalis, alderman and author of Vodka Shot, Pickle Chaser, and Nelson Lipshutz, author of The Mecca Plan. Upper Falls has been well represented at the first three slams with stories by Upper Falls'ers Kate Carney, Jane Aransky, Jen Kohl, Ashley Wasilewski, Patrice Westrate, and Jerry Reilly. If you haven't been to one of these events yet, you should. They are a great night's entertainment so come on down. Redistricting the Schools - The school department has begun working on a plan for re-redistricting the elementary schools in anticipation of the new Angier and new Zervas schools being completed. There are no proposals on the table yet, that won't happen until mid-June. Almost certainly there will be some changes in Upper Falls district lines. As far as I've heard, likely changes will not involve moving children between schools but will be focused primarily on putting incoming students into different schools. Right now we have kids going to Countryside, Angier and Zervas depending on which streets they live on. The most likely change in the Falls would be minor changes to those boundary lines for incoming students. Note, none of that is official in any way so its something we all should watch as the plans unfold. Here's your reading material. Now get to work! The Camels Are on the Move - Upper Falls's traveling Newton Nomadic Theater opened it's new show, The Beauty Queen of Leenane last weekend. This weekend the nomads will be in Auburndale Library for Sat evening and a Sunday matinee. Next week to Newtonville and Waban. The final week at the Newton Comummunity Farm and then back home to Dunn Gaherins on June 7. This show will grip you, it will scare you, it will make you laugh and give you chills. It features a fabulous cast including Upper Falls own Linda Goetz. Don't miss it! Howdy New Neighbors - Jeff & Mary, the former owners of Atlas Liquors recently sold the store to the Patel family. Stop in, say hello, and welcome the Patels to the neighborhood. We want to make them feel right at home before we rope them in to help out at next month's Feast of the Falls. Sign up for Tour de Newton - The 3rd annual Tour de Newton will be held on Father's Day, June 15. It's a great event for kids, adults, and casual bicyclists. The ride starts simultaneously at 9:30 AM in all 13 villages. You'll be riding with your Upper Falls neighbors and have a trained leader and sweep to guide you. The 20 mile, 13 village relaxed fun ride stops at each of Newton's villages, where you'll be welcomed with refreshments, a village badge, and an overview of the village by the locals. This year we have something for everybody: If the regular leisurely ride is too slow for you, sign up for the Contra tour - faster riders, shorter stops and traveling in the opposite direction. If 20 miles is too much, go for the Petite Tour - a 5 mile, 3 village loop that starts/ends at City Hall. Whichever way you ride it, the Tour de Newton is a great fun way to see and learn about the city. Sign up today. I'm Not Getting on One of Those - If bicycling is not for you then join some of your neighbors as the Upper Falls Greeters for the Tour de Newton. An Upper Falls delegation will be down at The Depot (Chestnut & Oak) all morning greeting the riders from all 12 other villages as they come through every 10 minutes or so - handing out Upper Falls badges and refreshments, and telling them a bit about our fair village. It's a great, fun, sociable way to spend a morning. If you'd like to join the fun, let us know. Did You Know ... Tears of joy, tears of happiness, and other types of tears all look different when placed under a microscope. Did You know ..." features an interesting and random fact every issue, collected by 7th grade Upper Falls resident Ian Wittler. Spread The News - Ask your neighbors if they get the Upper Falls News. If not forward them this issue and they can sign up for their own subscription here. 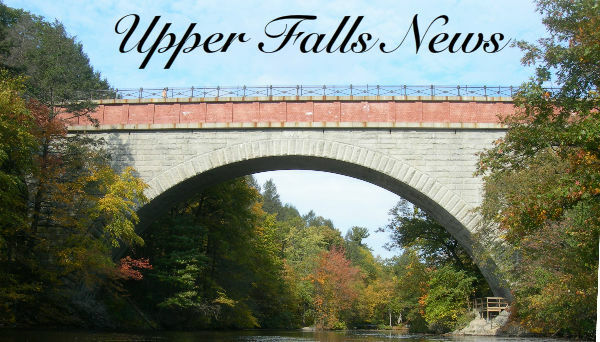 Send Us Your News - If you have any upcoming events, activities, news, trivia, stories, anecdotes or jokes related to Upper Falls just send them to news@UpperFallsNews.org and we'll include them in the next newsletter. For those who prefer living in the past, back issues of the Upper Falls News are archived at UpperFallsNews.org.